Present condition: the top is damaged and is missing one corner, and the bottom edge has been trimmed. Carved in relief, face A bears a cross outlined by roll moulding with squared terminals and a square centre to the head. The central panel is filled with triangular interlace and the side-arms with knotwork, while the upper and lower arms contain spiral work, and the top of the shaft is filled with key pattern. The background to the cross is plain. Face C has a wide flat-band moulding along the two vertical edges, which becomes a bird-headed creature in profile on either side at the top, each with a foreleg meeting the tip of its beak, and their heads just touching. Beneath them on the left is a goggle-eyed monster and on the right a beast’s head symbol. A roll moulding separates them from the panel below, which is subdivided vertically by roll moulding. In the left-hand panel is a robed or winged figure with an elaborate hairstyle or a halo, and holding a disc in the left hand. In the right-hand panel is an ornamented crescent symbol with a V-rod behind it. Primary references: Neish 1872, 73; ECMS pt 3, 229-30; Fraser 2008, no 66.2. No. 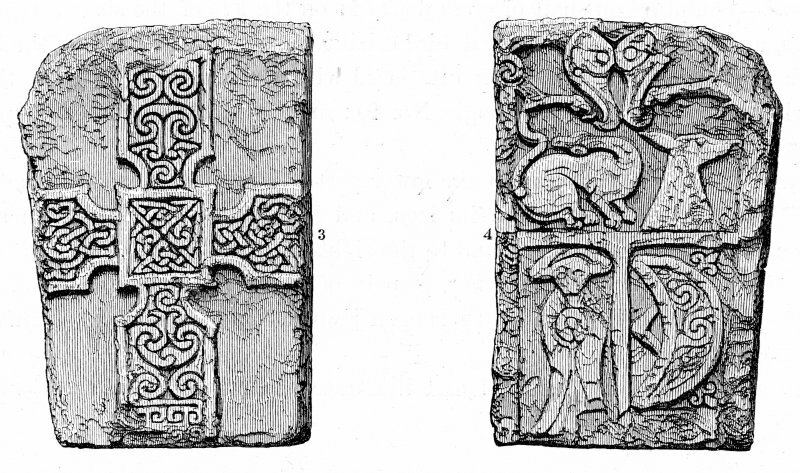 2 An upright cross-slab, measures 0.45m x 0.3m x 0.08m. Front - interlace cross. Back - bird-headed monsters, a crouching reptile and a deers head, above a cloaked figure and the crescent with V-rod symbol. 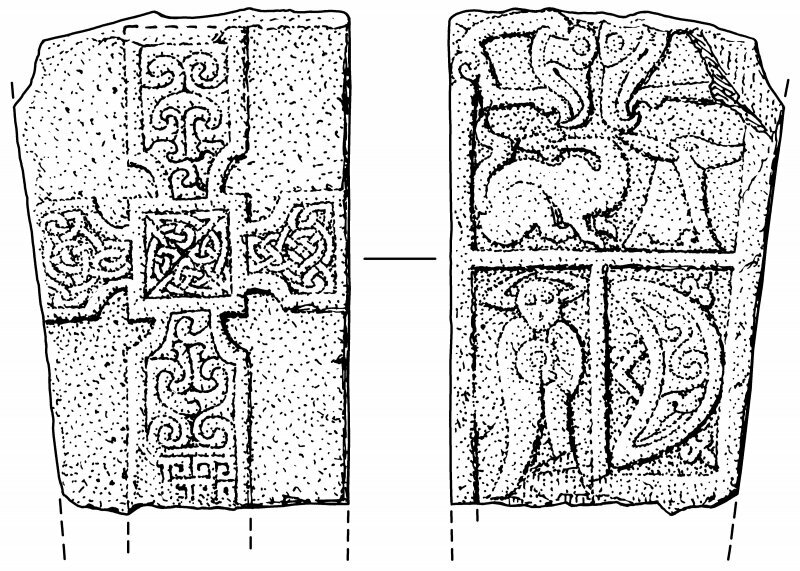 This cross-slab is in the RMS(NMAS) Acc.no. IB 27.